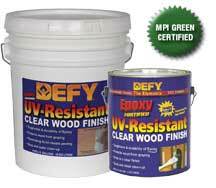 Defy UV-Resistant Clear Wood Finish is a clear deck stain designed with a clear UV inhibitor to prevent graying and protect the natural appearance of your wood. Now you can protect your wood from the damaging effects of the sun and moisture without altering the color of your wood. With annual maintenance, this deck sealer will make the natural beauty of your exterior wood more appealing by providing protection from the elements. Environmentally Friendly all Defy deck sealers are 250 V.O.C. compliant and have been approved by the Master Painter's Institute to be environmentally friendly. Click here to see the MPA list of Certified "Green Approved" products. Defy UV-Resistant Clear Wood Finish can be used on interior or exterior wood surfaces including: wood siding, log homes, decks, fences, shake shingles, outdoor wood furniture, pressure treated lumber and all other natural wood surfaces. Maintenance of this clear deck stain is easy! A quick application of Defy Wood Brightener will generally clean and restore previously treated surfaces to their original appearance. Once cleaned, a single coat application of this deck sealer will provide long-term beauty and protection. The surface should be recoated annually or when graying initially starts to appear. UV-Resistant Clear Wood Finish goes on milky white and dries to a clear, flat finish with little to no change to the natural look of your wood. It is sold in 1 and 5 gallon containers and covers 100-150 square feet per gallon depending on wood texture and porosity. Wood Decks 100-150 sq. feet per gallon for 2 coats.